Keith Giffen’s name is well known after doing three decades of work in comics. He first made his rep as the artist on Legion of Super-Heroes in the early to mid 1980’s, but before long he was writing his own comics. He revealed himself as a writer of comic superhero tales in various Ambush Bug comics, and when DC launched a new Justice League of America series in the mid-80’s, Justice League, Giffen’s rep as writer of comedies was pretty much set. His star is bright again (after dimming in the mid-90’s), and he’s also associated with upstart publisher, Boom Studios, for whom he’s producing a horror mini-series entitled TAG. It’s the macabre tale of a young man named Mitch who gets tagged with a pagan curse that turns him literally into the walking dead – although Mitch is alive, his body is a corpse and it’s starting to decay. By the end of the first issue, his girlfriend, Izumi, is trying to help him understand what happened to him. I found Tag’s story to be intriguing, and Giffen engages the reader to follow along with Mitch as he tries to unravel the mystery of his condition. However, the discovery in this series is really artist Kody Chamberlain, who pencils, inks, and colors his own work. He lives and works about a half-hour or so from me in Lafayette, LA, and I discovered his work at the encouragement of some friends. A few years ago, he drew a serial in the 30 Days of Night: Bloodsucker Tales mini-series. Some may also know Kody from a manifesto he wrote about the need for diversity in the genres comic book publishers and creators produce. Several website, including this one, published it last year. Chamberlain’s style is firmly rooted in a kind of urban realism. Even his color work comes across with a Film-Noir vibe. He reminds me of Frank Miller, Ho Che Anderson, David Mazzuchelli, and Bill Sienkiewicz, among others. Stylish with a solid sense of storytelling, Kody is perfect for the kinds of comics of which he’d like to see more: straight drama, crime, mystery, and horror. I look forward to seeing more of his work even if it meant seeing him on characters like Batman and Daredevil. I’m always whining about finding comics that are fun to read the way superhero comics were before they became so serious and the entire industry took itself so seriously (pre-Alan Moore?). I found my fun-tain of youth in THE GOON, when I got #17 as a free comic. Written, drawn, and colored by Eric Powell, the series focuses on a mafia hit man, The Goon, who cuts quite a hulking figure. He wears brown khaki pants, a wife beater shirt, and a hat that normally hides his eyes in shadow, although he apparently sometimes wears an old football uniform from his youth. His adventures are set in an unspecified era that blends the crime noir of the 1940 and 50’s with the pulp fiction era that seems pre-1930 or so. It is an old-fashioned gangster setting that also mixes in modern contrivances (such as TV) with sci-fi (giant robots). The issue I read definitely has a supernatural slant. Issue 17 finds The Goon in the middle of a plot by his arch-nemesis “The Zombie Priest.” He and his partner, a gun-toting kid with Little Orphan Annie eyes named Frankie, take on a horde of little blue monsters. I enjoyed every page of it, not just for the concept, but especially for the execution. Comics are visual, and if a writer/artist team or cartoonist can hit the right note, it’ll sell his concept to the reader. Powell does that. Visually, from the word balloons you read to the art that tells the story, The Goon has the right look to capture a B-movie vibe that recreates an era of films, books, and movies about men with guns and the monsters they fight. I can think of a lot of things of which The Goon reminds me: EC comic books, Warren horror magazines, Michael T. Gilbert’s Mr. Monster, etc. But best of all, it reminds me of fun comics. 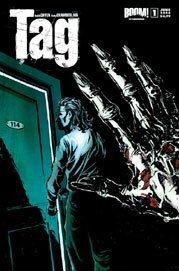 Tag and The Goon are available at your local comic book shop. 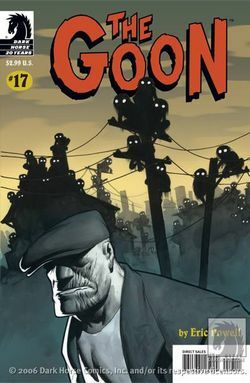 Their are currently five trade collections of The Goon in print. I'm also on the web at http://www.negromancer.com where I post my movie reviews.